Ruddie Marques sent this picture. This is a shot from my days with the Magic of Orlando. 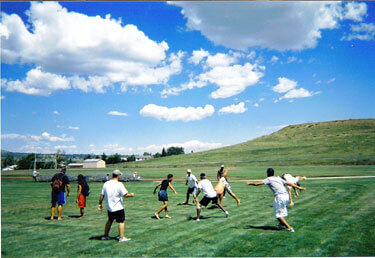 I took this picture just before one of our last rehearsal days in Denver, Colo., in 2004. This is mostly the baritone section with their tech—the fella who's upside-down there in the middle. The grass and the weather were so perfect at the practice field, they couldn't resist trying to do a little breakdancing before rehearsal began. We definitely knew how to have a good time!